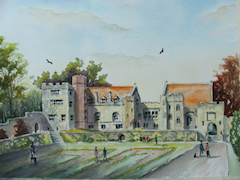 Crowborough Arts has collaborated with Penshurst Place for the past six years in holding winter art exhibitions and other events on the estate. 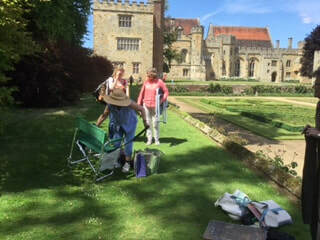 in 2017 we were thrilled to be asked to help celebrate Penshurst’s Year of Arts and Culture: our visual artists were invited to draw and paint, free of charge, in the formal gardens throughout the season. Over thirty artists took up the invitation and a wide range of excellent work was produced, so much so that a section of our Winter Exhibition was devoted to the works created during the project. We're delighted to be invited back for 2018. 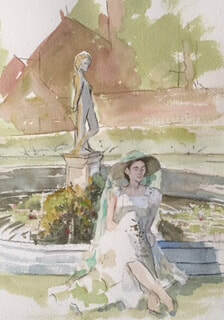 Members will need to re-apply for an Art in the Garden pass, valid for the new season. 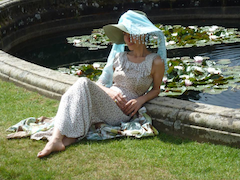 Details of opening times are on the Penshurst Place website. Still set out largely in the original Elizabethan ‘rooms’, Penshurst’s formal gardens are full of beautiful vistas, with the House as an unforgettable backdrop. The gardens are spectacular throughout the year, with glorious blossom and spring flowers early on, the famous double peony border in early June and later in the summer, the double borders of the Jubilee Walk with their lovely rainbow planting scheme. 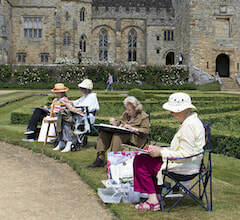 CA artists are particularly welcome to draw and paint during Penshurst’s Glorious Gardens weekend on 2nd and 3rd June. 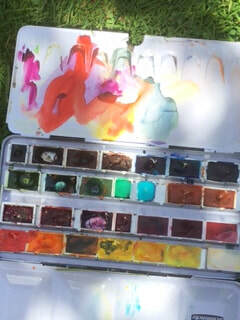 Last year around twenty artists turned out over the two days, thanks to glorious weather! Some chose to paint the house and garden, while others took advantage of the life models provided. The event was facilitated by our life and portrait tutor, Mary Harris. Some of the work generated can be seen below. Apply now for your 2018 Art in the Garden pass! Contact Gaye Jee on 01892 853294 or email her and she will arrange one to be sent to you. Please note, however, that you must be a Crowborough Arts member to take advantage of this offer. 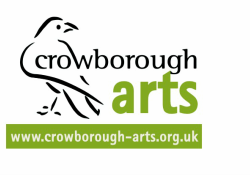 You must be a current member of Crowborough Arts to qualify for an ‘Art in the Garden’ pass. Please show your pass at the Visitor Centre upon arrival, and sign in. The pass grants entry to the gardens to the pass-holder only and is non-transferable. If you wish to visit the house, you must buy an upgrade ticket. 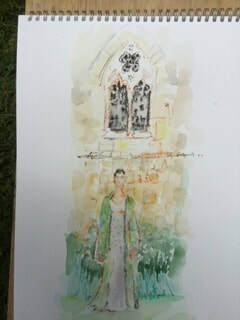 Please call Penshurst Place on 01892 870307 in advance of each visit. This is so you may be made aware of any restrictions such as weddings, events or garden maintenance. At least one day’s notice would be appreciated. You must arrive with everything you will need. Penshurst Place will be unable to provide any equipment. Please do not obstruct paths, walkways or exits and be prepared to move location on at any me, if requested to do so by a member of staff. You must not obstruct or tamper with any of the formal gardens. Penshurst Place will not accept any liability for lost or damaged equipment during your visit. Please observe the “no picnicking” rule in the formal gardens. You are of course welcome to use the designated picnicking areas or to visit either of the estate’s restaurants. 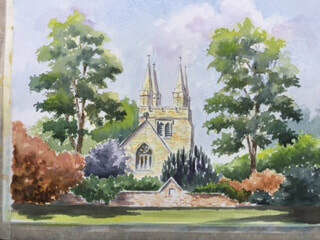 To request your Crowborough Arts ‘Art in the Garden’ pass, please email Gaye Jee or telephone 01892 853294.